Welcome back to the last day of our First Looks for January. All new stamps will be available for purchase by 9:00 AM EST tomorrow morning in our store. We also have our monthly Stampede with our Design Team to kick off the release, so make sure you join in the festivity. There will be plenty of inspiration and giveaways! I had the idea of creating cool constellation patterns, if cute characters isn't your thing. With Starry Night, you can create your own astrology signs by piecing the lines together. A quick Google search will yield many examples. I think it's super cool! Starry Night is chocked full of sentiments. 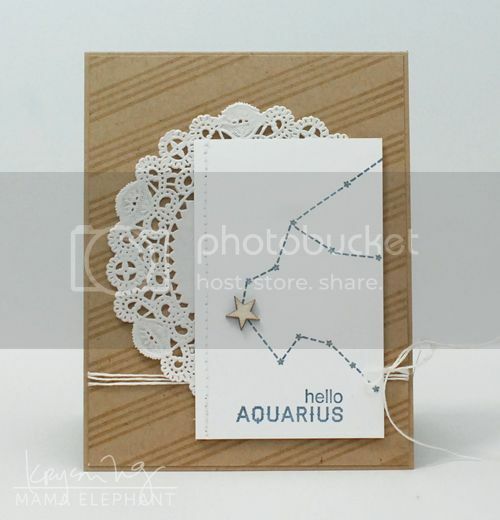 You'll find all 12 astrology signs in a unique font as well as many complementing sentiments. Starry Night will be available for purchase on January 15th. Starry Night in a 4x6 clear acetate sheet and will retail for $15.00. Starry Night contains a total of 32 stamps: 27 sentiments and 5 images. The constellation dashed stamps measures 1-1/16", 7/8", 5/8", and 7/16"; "Libra" measures 3/4". I decided to go the feminine route with today's card. I love, love, love doilies. 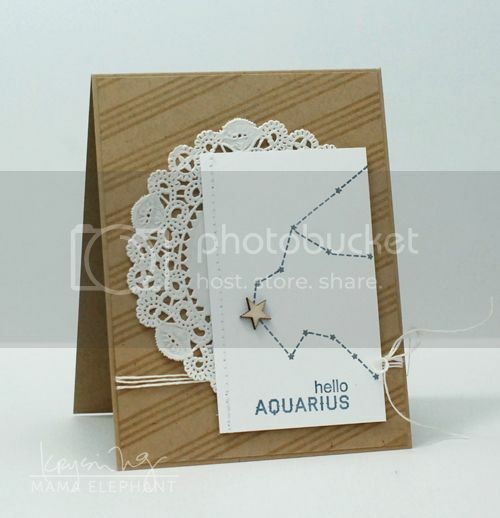 I would seriously use it in every card and layout I make, but I'm sure someone out there will think I'm nutty if I do! Maybe I'll just sneak it in once every couple of weeks and no one will notice my obsession with them. I'm not much of a layering, fussy kind of designer, but when I do I still tend to keep it very clean and simple. I think it's important for the images to be the focus and everything else should play the supporting role. I stamped the stripe background with Basic Borders with Versamark ink. Tone on tone stamping always look incredible! I looked up the constellation pattern for Aquarius and stamped it with navy ink. After the stamping was complete, I colored the stars with a light glitter pen. The Sakura Gelly Roll pen is the best for light sparkly touch ups. My glitter pen was one of my first crafty purchases and one of the few I haven't ever regretted buying (how many border scissors did you buy?!) and they're still going strong! I hauled out my sewing machine and sewed a little border to the side. A veneer star finished the card off. I generally don't like to leave my cards "naked" when I tie strings or ribbon around it, it just seems messy to me. The solution is to do a little layer so you don't have anything hanging loose behind the card. So, what do you think of Starry Night? It's a sophisticated balance to the adorable images in Cosmic Stars! Lovely card and such a clever idea for a stamp set. Looking forward to tomorrow's release!